The title of Viceroy and/or Captain General was already used at the time of Emperor Lothar II (1137) , and also during the Angevin and Aragonese ruling. Louis of Armagnac , Duke de Nemours was Viceroy ( 1502 ) on behalf of Louis XII of France. 1507 Antonio di Cardona , Marchese di Padula as Lieutenant when Cordoba left. Antonio de Guevara , Count of Potenza as Lieutenant when Aragon left. 1522-27 Carlo di Lannoy , Viceroy on behalf of Emperor Charles V.
1532-53 Pedro di Toledo , Marchese di Villafranca. by Philip II when his father invested him of the Kingdom of Naples. 1556 Federico Alvarez di Toledo , Interim when his father went to Spain. 1571-72 Diego Simanca , Bishop of Badaxo , Lieutenant when Perrenot went to Rome for the election of Gregory XIII. 1575-79 Inigo Lopez di Mendoza , Marchese di Mondegiar. 1586-95 Juan de Zuniga (nephew of the Commander ) , Conte di Miranda. 1622-29 Antonio Alvarez de Toledo , Duke of Alba , Knight of the Golden Fleece. 1629-31 Fernando Afan de Ribera , Duke of Alcala. 1631-37 Manuel di Zuniga e Fonseca , Count of Monterey and Fuentes. 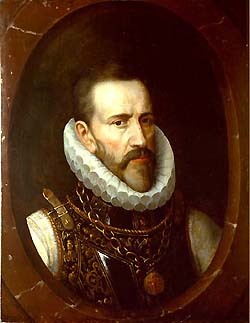 1637-44 Ramiro Felipe Nunez de Guzman , Duke of Medina de las Torres. 1644-46 Juan Alfonso Enriquez de Cabrera , Admiral of Castile , Duke of Medina de Riosecco. Don Juan of Austria . 1659-64 Gaspar Bracamonte y Guzman , Count of Penaranda .